Preheat oven to 180°C. Season the osso bucco with salt and pepper, add about 2 tablespoons of oil, and mix well. Heat a large frypan over a medium-high heat. Brown the osso buco in 2 or 3 batches. Remove each batch and place in a large casserole dish. Reduce heat in the pan, add a little oil, and the diced onion, carrot and celery, and cook for 1–2 minutes, stirring occasionally. Sprinkle in flour and stir until the vegetables are coated. Gradually pour in the combined wine, puree and stock. Stir until the mixture boils, add bay leaf and then pour over the osso buco. Cover the casserole dish, place in oven. Check every 40 minutes or so and add water if needed to keep the ingredients just covered. cook until the osso buco is very tender. Sprinkle with the lemon and parsley garnish to serve. Combine all ingredients and season with freshly ground salt and pepper. Cooktop method: Place the browned osso buco and other ingredients in a heavy based pot. Partially cover and keep heat low. Stir occasionally and add water if needed during the cooking time to keep ingredients well covered. Simmer until the meat is very tender. Don’t rush the initial stage of browning the meat. This will make your casserole rich in colour and flavour. Brown the meat in small batches over a medium-high heat. A casserole will keep for up to 2 to 3 days in the refrigerator. Casseroles should be refrigerated immediately after the steam from cooking has evaporated. Place the hot casserole into a shallow container, and then into the fridge so it cools quickly. Do not leave it to cool completely on the bench. To serve bring it slowly to the boil over a medium heat, reduce heat and simmer for about 3 minutes, or until the meat and sauce are both thoroughly hot. 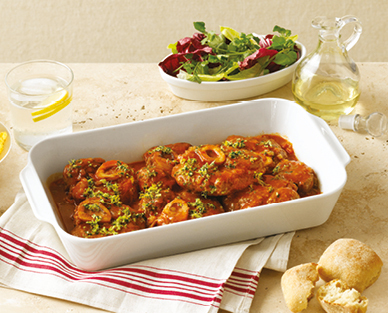 * Osso bucco is Italian for ‘bone with hole’, and it’s the meaty bone pieces which give this dish such robust flavour. You’ll need to take it slowly though, it takes time and gentle cooking to release their succulence.